Actor, producer and DJ Idris Elba is the latest celebrity to join the growing list of stars opening his own bar in October. 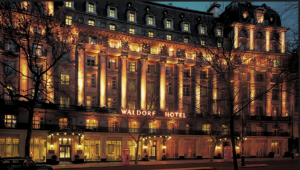 The Parrot which is within the Waldorf Hilton hotel in London, will be turned into a cocktail bar and live music venue. The bar will offer everything from a hidden cocktail menu and delicious small plates, to secret shows and exclusive events. The venue even has its very own chauffeur-driven car, so VIP guests can arrive and leave in luxury. Nightly entertainment is also on offer, with a professional house band performing popular covers. The bar will also host secret shows and screenings. It’s now common for celebrities to branch out into different business ventures. Idris Elba will open the 60-seater venue in partnership with twin brothers Lee and Nick Caulfield.